Sports anime. A genre of anime that many are reluctant to get into because they think they won’t like it. I too, was once one of those naive otaku until a friend forced me to watch Haikyuu! (referred to as Haikyuu from now on); it was one of the greatest anime experiences of my life. For those who have watched the breakout hit, or those considering it, this will be an article praising the show. For those hesitant to start it or straight up denying it, this article will do everything in its power to change your mind. A little background on the show. 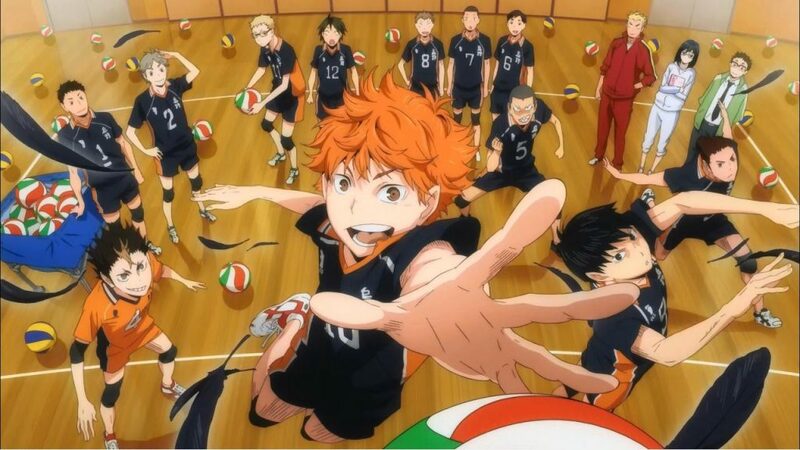 Haikyuu is a sports anime centered around the Volleyball team of Karasuno High School. Sporting 3 seasons as of now, with a 4th coming this year in 2019, and 3 movies/recaps; the show is based on a manga of the same name by Haruichi Furudate serialized in the Weekly Shonen Jump magazine. The anime began airing in 2014. Haikyuu is an anime loved by many and for a damn good reason. Let’s break this down into parts. Haikyuu boasts one of the clearest examples of a simple story brought to its best. A classic story of a fallen powerhouse school, now considered an underdog, attempting to rise back to its previous status and win the National Volleyball Tournament. Simple, but insane. To reach the National Tournament, a team must first win the Prefecture Tournament which happens 4 times a year (I think; it might be 3). Even within the Prefecture, there are a number of powerhouse schools that need to be overcome, including the undefeated Shiratorizawa. Since I am trying to keep the article as brief as possible, I won’t go much into Hinata and Kageyama’s backstories but they form a dynamic which reminds me of the one we had between Aang and Zuko in The Last Airbender. That is one of the highest compliments I am possible of giving. Throughout the show the story is well-paced and consistent. Although it is a basic premise the show never ceases to build an insane amount of tension and get you extremely excited for what comes next. I do not not love a single character in Haikyuu. Not even the antagonists. I love them all, and so does everyone who has watched the show. They are humanized, characterized and fleshed out as much as any characters are. This could be accounted to the fact that they are, of course, not actually evil. Just another group of people trying to do the same thing. I feel like this show embodies the meaning of ‘the opposite of justice is not evil, but the other justice’. Even when facing off against Nekoma, Dateko, Aoba Johsai or even Shiratorizawa, I felt the desperation and determination of both sides to win the match. It made me love every single character in the show, and if you tried to make me pick who is my favourite character, it would be like picking who is my favourite parent, or member of the The Last Airbender’s Team Avatar. Impossible. Onto our main cast of characters. The leads, Hinata and Kageyama are amazing characters. As aforementioned, they create a dynamic unlike any other and the relationship and interactions they have with each other are one of the many reasons this show is considered one of the best. Other characters like Daichi, Suga, Tanaka, Nishinoya, Tsukishima and the rest of the Karasuno High School Volleyball team are also an integral parts of the show. Each character feels like the protagonist of his or her own story and this creates such complex character dynamics and relationships as well as individual stories, that the show feels more like the journey of the Hinata and Kageyama, but more the journey of the whole team. I have to say, the character building in this show, and the characters in general, are flawless. The animation for Haikyuu can be described as the ultimate hyperbole. Although in reality Volleyball matches do not take place like they do in the show the animation does a fantastic job of conveying how the players must feel, and the people invested in the game as well. The dynamic movements in the matches as well as the slow downs which suggest the impact of a scene or event are amazing and make the show all more enjoyable. With cuts to hand drawn moments, as well as some crudely animated portions to portray the tension at that point; the animation does exactly what it needs to and more. Perfect animation. Emphasis on the fact that 11/10 is impossible and unreal. Similar to how surreal and fantastic the soundtracks for all 3 Haikyuu seasons are. Let’s start with the openings. Although the openings for Season One were nothing special; Season Two is where it gets interesting. OP 1 Believer was a great song that matched the tone of the show and the series. It went well with the plot and fitted the tone. OP 2 for S2 was Fly High! by BURNOUT SYNDROMES, a song that quickly became one of my favourite songs and made itself onto my playlist. It matched the aspirations that the characters had and set a really good tone for every episode. As Season 3 was only 10 episodes long it only had one opening, Hikari Are. This song quickly took Fly High’s spot as my favourite anime opening and is the pinnacle of opening songs. It set an incredible tone at the beginning of each episode and built up for the match against Shiratorizawa. The song got me so excited for the episode ahead that it’s hard to put into words. Just impeccable. The voice acting and the soundtrack for the show is also very well done; it plays well into the mood and atmosphere of the show and there’s nothing I can say against it. I believe enjoyment is a factor that is the most important for shows. I also believe that it, to some extent, depends on the other factors. Haikyuu is one of the most enjoyable and satisfying shows I have ever watched. It is not afraid to kick its characters to the ground and seeing them get back up is incredibly satisfying and enjoying. This show is just too good. It brings up a plethora of different emotions throughout the show and invokes so many complex feelings in you that you can’t help but love every character and enjoy watching them progress. I don’t think I have left much unsaid regarding Haikyuu. It is an incredible show that quite easily made its way into my favourite anime of all time. The complex characters, amazing writing, impeccable animation and mind blowing soundtrack make for an incredible experience. Pure, whole-hearted fun. Haikyuu is easily one of the best anime of all time and if you have not watched it. What the hell are you doing?